Do you have a few days to spare and would like to discover a bit of Portugal? 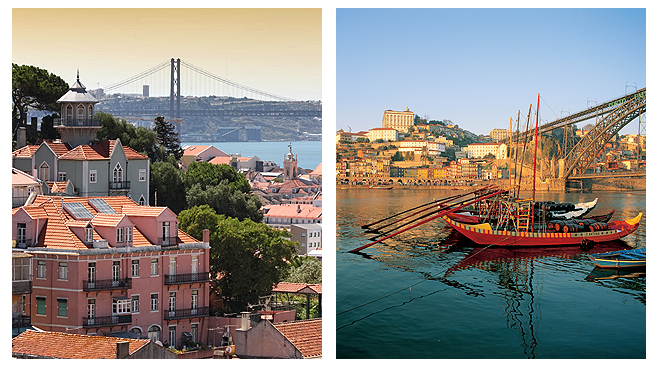 Why not start with the country's two main cities, just a short flight from some of Europe's major capitals? 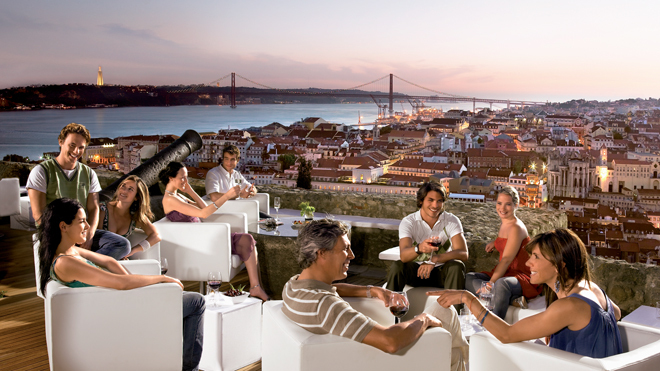 Lisbon, a city filled with light standing next to the River Tagus and the sea, or Porto, which shares its name with the famous wine, produced on the slopes of another river – the Douro. If you choose Portugal's capital, Lisbon, start by visiting the Baixa Pombalina, in the very heart of the city, bounded by the magnificent square called Praça do Comércio, which opens on to the river. The views are best appreciated by heading uphill to St. George's Castle, the Santa Justa Lift or other viewpoints, such as São Pedro de Alcântara and Graça. Another interesting thing to do is take a tram ride through the typical neighbourhoods of Alfama and Mouraria. The views over the built-up area and the Tagus, which unfold before your eyes at every turn, will take you by surprise, and perhaps the melody of fado music will too. Other not-to-be-missed experiences include a trip to Belém to sample the famous custard tarts and to visit the Jerónimos Monastery and the Belém Tower. Like fado, they are UNESCO World Heritage. You could also explore the Museu dos Coches (National Coach Museum) and Belém Cultural Centre and, at the other end of the city, the Parque das Nações (Park of Nations), a fine example of modernity with squares, gardens and one of Europe's largest oceanariums. If it's nightlife you're looking for then either stay along this stretch of the river or head to the Bairro Alto neighbourhood. Lisbon is also a great city for shopping. The best shops are to be found between the Avenida da Liberdade and the Chiado, in the Príncipe Real or in the shopping centres. But in this respect, the city of Porto is a serious rival. From the city centre, known as the "baixa", where the main shopping street is the Rua de Santa Catarina, to the Clérigos, or the Boavista – Foz – Avis area, all of which boast ultra-chic shops and top brand names. And the range and variety are rounded off in the surrounding areas by Gaia and Matosinhos. 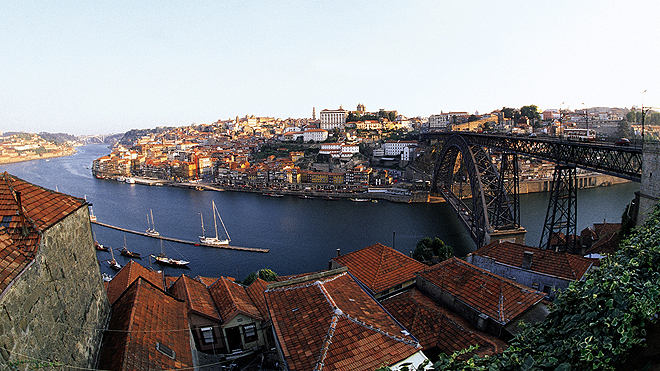 Located in the oldest region of the country, Porto also boasts a huge wealth of heritage. The historical centre, for a start, is a UNESCO World Heritage site. Explore it by visiting austere and imposing granite monuments such as the Sé (cathedral), the Clérigos Church and Tower, the Palácio da Bolsa (Stock Exchange Palace) and the Church of São Francisco, which will surprise you with their rich interiors. Or go for a stroll along the highly popular Ribeira, the waterfront area alongside the River Douro. Boat trips set off from here that will give you the chance to see the city from a different perspective. Go on one of the "rabelo" boats that were once used to transport barrels of wine from the wineries on the slopes of Douro to the wine cellars in Vila Nova de Gaia, a must-do trip with an opportunity to sample this incomparable drink. You should also explore the modern buildings, such as the Serralves Foundation and the Casa da Música (House of Music), which offer very interesting cultural programmes. And if you need a few moments simply to relax, there's no better way than taking a tram ride to Foz or spending the afternoon chilling out at one of the open-air cafés overlooking the river or the sea.